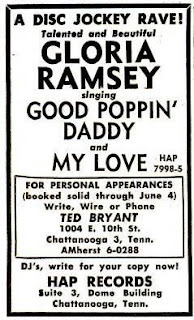 Hap was a label based in Chattanooga, Tennessee. To be honest, I have not much information on the company except that it was owned by Herbert "Happy" Schleif, who was said to "[...] always had a delightful grin on his face," thus the label's name. 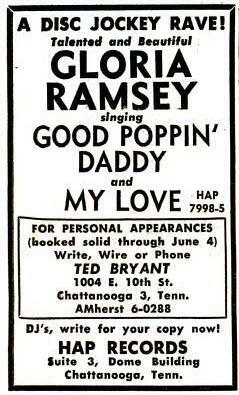 It was a subsidiary of Schleif's Mountain City recording studio, located in "Suite 3, Dome Building" in Chattanooga. The Dome was built in 1892 for the Chattanooga Times and it seems that it later housed also offices by other businesses. "I don't recall anything about the label. It was an old 45 single. I think Norman Blake was on the dobro, Peanut Faircloth was singing. My late wife Marshall wrote the words, borrowing heavily from a Jimmy Van Heusen tune (It Could Happen to You), and I supplied the melody. I was playing with the Dixie Land Drifters at the time (Norman, Cecil Powell, and Howell Culpepper)." It is not known where these song were laid down on tape, possibly at the Mountain City studio. However, for their next release, the Dixieland Drifters visited Murray Nash's Recording of Nashville studio in Nashville, Tennessee, where they recorded "Bongos and Uncle John" and "How Big a Fool," first released on Hap #1009 in 1961. "Bongos and Uncle John" was re-released on 20th Century Fox as well as twice on Murray Nash's Do-Ra-Me label. For further reading on the Dixieland Drifters, see American Music Magazine issue #130 (09/2012). 1018: Earl Scott - Opal Lee / ? 1025: Jim Taylor and the Yellow Jackets - Zemo / ? 1060: Viola Schleif & Cathy Chapman - The Voice of the Americans / ? The Dome Building in Chattanooga, Tennessee, home of Hap Records. Hi Lon, that's some really great memories from Mr. Fletcher. I wrote an article about the Dixieland Drifters. Do you have an email adress? I am a graduate student at the University of Memphis working on a dissertation on Norman Blake. I came across your website while trying to research Norman's early career and compile a discography of his recording activities with the Dixieland Drifters. Your site contains much valuable information. I noticed above the reference to an article you wrote on the Dixieland Drifters. Would it be at all possible for you to forward me the article or let me know how I might access it? Please do contact me at dfleck@memphis.edu. Any assistance or further information you could provide on the group and its recording activities would be very much appreciated. Hello! I'm a lifelong resident of Chattanooga,and I thought I might have some useful information about HAP records. My great-grandfather was the man running the studio here at Chattanooga. His name Herbert Schleif. Everyone who knew him called him "Happy" Herbert because he always had delightful grin on his face, thus the name HAP records was derived. The story also goes that he was good friends with Norman Blake. At least this is what my grandmother has told me. I didn't believe her at first tell she handed me an old 45: HAP 45-1060, "The Voice of the Americans" with Viola Schleif and Cathy Chapman. I realize a random isn't a reliable source, but I did find this thread. thank you! Great information. Do you have an email adress? 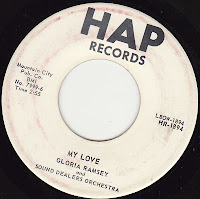 I'd like to know more about HAP Records and I consider a much more detailed article. I'm afraid that's all I know at the moment, but I will definitely get back to you as soon as I have more information. My grandmother will be thrilled to know that there is someone interested in her grandfather's history. Hap was an acronym for Herb and Peanut. They were partners with the label. I was at Herb's house near Soddy Daisy a number of times. I remember him as a fine fellow. My memories of the Dixieland Drifters were mainly going way out lookout mtn, past plum nelly to the Blake home place when they'd rehearse. It was dad, Hal, Charlie and Norman at that time. thank you for sharing your memories with us. Would like to get in touch with you regarding Hap and the Dixieland Drifters. You can find my email adress on my profile page! Herbert and Viola Schleif was my mother and father in law's. ..I joined the family in 1976 and gave them the youngest 2 grandchildren. ..Beth and Jason Schleif. ..they would be so proud of them. .I've met a lot of these people..not to mention Ray Stevens got cigarette money from Herb before he became the man we know today. ..my children have records that was recorded by Viola. .they don't have a way to listen to them because of technology today. .no turntables. His name was Herbert Hap Schleif. ...he also had a twin brother. They called him Junior. ..HAP WAS HIS MIDDLE NAME. .
Cheryl, any chance to contact you concerning Herbert Schleif?